"Avago" redirects here. For the Irish/UK television channel, see Avago (TV channel). Broadcom Inc. is an American designer, developer, manufacturer and global supplier of a broad range of semiconductor and infrastructure software solutions. Broadcom’s product portfolio serves the data center, networking, software, broadband, wireless, and storage and industrial markets. Tan Hock Eng is the company's president and CEO. The company is headquartered in San Jose, California. Avago took the Broadcom part of the Broadcom Corporation name after acquiring it in January 2016. The ticker symbol AVGO that represented old Avago now represents the new merged entity. The Broadcom Corporation ticker symbol BRCM was retired. The company was founded in 1961 as a semiconductor products division of Hewlett-Packard. The division separated from Hewlett-Packard as part of Agilent Technologies in 1999. KKR and Silver Lake Partners acquired the chip division of Agilent Technologies in 2005 for $2.6 billion and formed Avago Technologies. Avago Technologies agreed to sell its I/O solutions unit to PMC-Sierra for $42.5 million in October 2005. In August 2008, the company filed an initial public offering of $400 million. In October 2008, Avago Technologies acquired Infineon Technologies' Munich-based bulk acoustic wave business for €21.5 million. In 2009, Avago Technologies went public on NASDAQ with the ticker symbol AVGO. Avago Technologies announced its agreement to acquire CyOptics, an optical chip and component supplier, for $400 million in April 2013. The acquisition aimed to expand Avago Technologies' fiber optics product portfolio. In October 2013, Avago Technologies invested $5 million in Amantys, power electronics technology provider, as part of a strategic investment agreement between the two companies. Avago Technologies announced its agreement to acquire LSI Corporation in December 2013 for $6.6 billion. The acquisition helped move Avago Technologies away from specialized products and towards a more mainstream industry, which included chips, especially storage for data centers. The company sold its SSD controller business to Seagate in May 2014. In August 2014, the company was the ninth largest semiconductor company. Avago Technologies agreed to sell LSI's Axxia Networking business to Intel for $650 million. The company also agreed to buy PLX Technology, an integrated circuits designer, for $309 million. In February 2015, it was announced that Avago Technologies Limited had reached an agreement to acquire Emulex Corporation for $8 per share in cash. On 28 May 2015, Avago announced that it would buy Broadcom Corporation for $37 billion ($17 billion cash and $20 billion in shares). The combined company, which would be named Broadcom Ltd., would have annual revenue of $15 billion and a market value of $77 billion. Broadcom Corp. strengthened Avago Technologies' patent position significantly in sectors such as mobile, the data center and the Internet of Things and made the company the ninth largest holder of patents among the top semiconductor vendors, according to an analysis by technology consulting firm LexInnova. According to the company's web site, the transaction closed on 1 February 2016. In 2016, Broadcom proposed merging with Brocade Communications Systems. The merger was delayed for review by the Committee on Foreign Investment in the United States. In 2017, Broadcom announced it would relocate its legal address from Singapore to Delaware, which would avoid the review. This action was linked to the parent company being renamed from Broadcom Ltd. to Broadcom Inc. The pre-2016-merger Broadcom, Broadcom Corp., remains as a wholly owned subsidiary of the renamed parent Broadcom Inc. In November 2017, Broadcom proposed to purchase Qualcomm for $130 billion USD, which was rebuffed by Qualcomm's board. President Trump blocked the revised $117 billion merger by an executive order that cited national security concerns. On July 11, 2018, news sources reported that Broadcom and CA Technologies agreed on terms for $18.9 billion acquisition. And on November 5, 2018 Broadcom announced that it had completed the acquisition of CA Technologies. 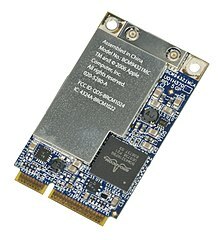 An Apple AirPort Extreme Wi-Fi card that uses a Broadcom chip. ^ a b c d e f "Broadcom 2018 Annual Report (Form 10-K)". sec.gov. U.S. Securities and Exchange Commission. December 2018. ^ Andrew Meola (26 February 2014). "Why Avago Technologies (AVGO) Is Up Today". The Street. Retrieved 2 January 2015. ^ a b Steve Johnson (16 December 2013). "Avago offers $6.6 billion for San Jose chipmaker LSI". Contra Costa Times. Retrieved 2 January 2015. ^ Mark Hachman (1 December 2005). "Avago Looks to Mobile". eWeek. ^ a b c d Chris Mellor (16 December 2013). "Avago Technologies chomps up LSI for BEELLLIONS - in CASH". The Register. ^ a b Soid Ahmad (29 August 2014). "Don't Ignore These Catalysts". Seeking Alpha. Retrieved 2 January 2015. ^ a b c Alex Saltarin (17 December 2013). "Avago Technologies buys chip maker LSI Corp for $6.6 bn". Tech Times. Retrieved 2 January 2015. ^ a b c "Intel Corporation Acquires Avago's Networking Business". ValueWalk. 14 August 2014. Retrieved 2 January 2015. ^ "Agilent chip group reborn as Avago". EE Times. 5 December 2005. Retrieved 2 January 2015. ^ "LED maker Avago Technologies Ltd. files for IPO". LEDs Magazine. Retrieved 2 January 2015. ^ "Avago Technologies (AVGO) Files $400M IPO". Street Insider. 25 August 2008. Retrieved 2 January 2015. ^ Richard Wilson (1 October 2008). "Avago buys Infineon RF filter design team". Electronics Weekly. Archived from the original on 5 January 2015. ^ a b Himanshu Arora (17 December 2013). "Singapore's Avago to buy storage chip maker LSI for $6.6 billion". Techspot. Retrieved 2 January 2015. ^ Valerie Coffey (19 April 2013). "CyOptics Acquired for $400M by Avago Technologies". OSA. Retrieved 2 January 2015. ^ a b "Avago Technologies to buy CyOptics". EET India. 12 April 2013. Retrieved 2 January 2015. ^ Paul Buckley (1 October 2013). "Avago Technologies makes strategic investment in Amantys". EE Times. Retrieved 2 January 2015. ^ Barr, Alistair (16 December 2013). "Avago agrees to buy LSI for $6.6 billion". USA Today. ^ a b Michael J. De La Merced (16 December 2013). "Avago to Buy LSI for $6.6 Billion". New York Times DealBook. Retrieved 2 January 2015. ^ Dave Altavilla (21 January 2014). "LSI Set To Take PCI Express SSDs Mainstream With SandForce SF3700 Controller". Forbes. Retrieved 2 January 2015. ^ "Intel acquires Avago networking business for US$650m". Malay Mail Online. 14 August 2014. Retrieved 2 January 2015. ^ Sarah Drake (23 June 2014). "Avago to buy PLX Technology in $309M deal". Silicon Valley Business Journal. Retrieved 2 January 2015. ^ "Avago Financial News 2015-02-25". ^ "Broadcom to be Acquired by Avago Technologies for $37B". Bloomberg. 28 May 2015. Retrieved 28 May 2015. ^ "Avago to buy Broadcom in $37 billion deal". CNBC. 28 May 2015. Retrieved 28 May 2015. ^ Nicole Arce (29 May 2015). "Avago To Acquire Rival Firm Broadcom For $37 Billion: Should Intel Worry?". Tech Times. Retrieved 20 September 2016. ^ "Avago/Broadcom Create Patent Powerhouse". EETimes. ^ Miller, Zeke; O'Brien, Matt (2 November 2017). "Trump announces company's return to US". Washington Times. Associated Press. Retrieved 2 November 2017. ^ "Broadcom Inc. from Broadcom Ltd". sec.gov. U.S. Securities and Exchange Commission. ^ "Chipmaker Qualcomm spurns $130 billion Broadcom merger bid". Japan Times. AFP-JIJI. 14 November 2017. Retrieved 3 December 2017. ^ "Trump Blocks Broadcom Takeover of Qualcomm on Security Risks". 12 March 2018 – via www.bloomberg.com. ^ "Broadcom Agrees to Buy CA Technologies for $19 Billion". 11 July 2018 – via www.bloomberg.com. ^ "Broadcom Inc. Completes Acquisition of CA Technologies". Broadcom. 5 November 2018. ^ "Broadcom 2018 Annual Report (Form 10-K)". U.S. Securities and Exchange Commission. December 2018.